Material handling systems are designed to get the right raw materials in the correct proportions from the railcar, silo, box or bag to the extruder throat. Gravimetric blending and gravimetric extrusion yield control are the ultimate in assuring the correct materials and proportions make it into the final product, while providing complete documentation and inventory control. 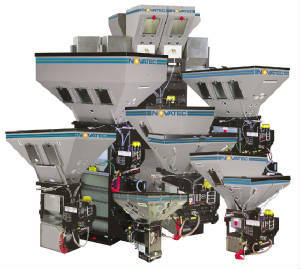 For film lines, whose ground scrap is too light to be handle through conventional means, automatic scrap reclaim systems can close loop meter scrap back to the process at the highest levels possible without having to re-pelletize. Automated resin handling and bulk storage capabilities reduce resin and labor costs, and product waste. Gravimetric blending and control conserve resin and expensive additives, while assuring quality. Automatic, inline film scrap reclaim reduces labor and cost, while conserving product quality.